in my little gallery area here at the Guild. and how the fracturing technique changed my regular imagery. in a more adventurous way. who have the same goal. I took workshops from great artists like Dan Gerhartz...twice! see any of her signature brushwork above? I enjoyed one with her. to try and get loose like him. So I ask you... do you see any of it in the painting directly above? thing would have stuck from the workshops. and that was ordinary realism painted in a safe and normal way. forgotten my brushes on a paintout. More on that breakthrough tomorrow! her blog. She recommends a great book too so be sure to visit. Flowers and Fechin. Two lovely pieces. and said so on her wonderful blog called Illustrated Life. the wide range of excellent tutorials available. I hope you visit their blogs. Hi Julie, it's been really fun being introduced to new artists via your blog. Even though they are using your technique, they are all very unique. You are so prolific, you really inspire me. Do you ever hit a block or a slump, or are you able to just work through it? Also I really admire alot of the same artists as you, I'll be taking with Ovanes in France this spring! I am glad you enjoyed seeing the other artists work. Yes - I certainly have hit a few blocks in my time - I think it comes with being a creative type. When I was an illustrator, block or no block I had to meet the deadline. Having a strong command of established work habits and technique helped the most. I try to remember that now I work for myself. Ovanes in France - WOW. I took from him over 10 years ago. I learned more about color from him then anyone before or after. You are so right Helen - the need to keep growing in art skills and knowledge is paramount for an artist. Thanks for the nice warm fuzzy. Still thinking of those luscious lemons! Best use of a credit card I ever heard of! Still haven't had a chance to try your fracturing technique, Julie, but will soon. And regarding yesterday's turnips. I love them both! Two different sounds of music, one quiet and the other buoyant. Thanks for the lovely comment on the turnips. And I love your beach scene - gorgeous! I was about to comment this one yesterday when it suddenly disappeared, I assumed you accidentally posted it a day early. I think the new one is so much better than the old one. I think we have the same goal, or at least partially. Like you I also get inspiration and learn from other artists, you included, but I don't want to be a copy. I want to be me. Sorry for rambling. Your are right - dear old blogger got away from me! I agree that we all want to be our own artists and not a copy so sure we take techniques but strive put our own vision on them. I see things I would never want to paint but someone else can make the same thing look like a million dollars. I went to a paint-out once in Calif. Some famous plein-air artists participated and as I went round to watch them paint, I could see the individuality of each artist. Hanging night was a different story. They all looked the same, when framed and hung on the wall. Only two artists who had very different techniques stood out. The individual ones were NOT the best artists but it certainly struck home with me when I could not discern my fav artist's work. Have I told you this story before? I rambled too, but love the dialog. I want to try fracturing now- thanks for posting this.I like both paintings a lot! Thank you Sally, love the Mrs Patmore painting you did. What fun. Loved Downton Abbey too. I so enjoy looking at your work. I very rarely paint in oils, but when I do I often mess them up a little with my fingers. So does that mean I have fractured fingers? I enjoyed a good laugh at that one. Thanks for the fun visit. 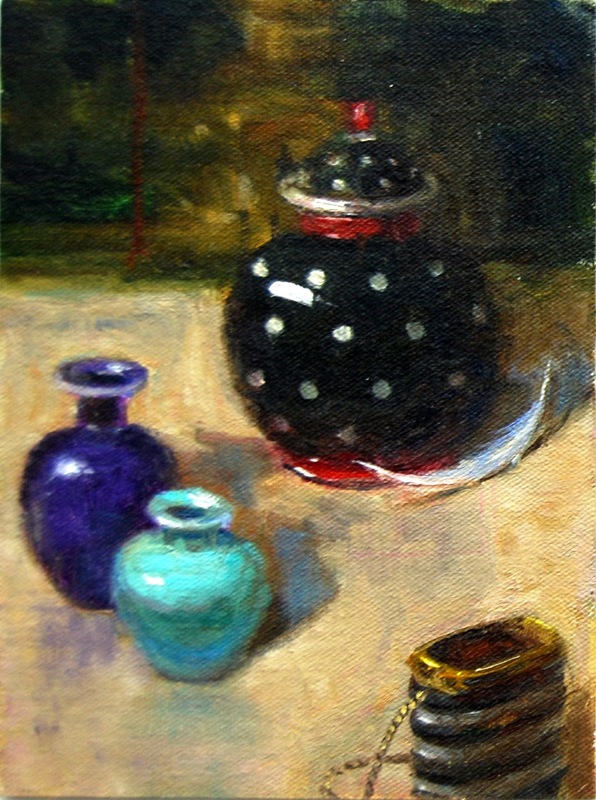 Dear Julie ,your still- life is superb!That the Arbyte has set in motion is fantastic! Nice to meeting other painters, nice to think to work even through your experiences and those of others. I tried to make the shapers, with a little imagination. When you read my post you will see... how! I MIND BOGGLED AT YOUR WONDERFUL PAINTING! i WILL SHOW IT LATER. It's fun to read about all the workshops you've taken...I have taken quite a few too (one from our friend, Ovanes)...a I am heartened to know that you would retain just "one" thing later from the workshop(s)...(I thought it was "just me"! haha). This is a tough business we're in. Good thing we're resilient. Thanks for the two versions of the painting. I do like the "fractured" one best! Oh Celeste - I cannot tell you how much your new turquoise chair excited me today. How I genuinely wish I could have done that one. The portrait was good but was it as exciting as the chair to you? Hi Jane - I love your pink tulips - made me feel all springlike. I agree with you. I think a dedicated artist will always find their own voice. I loved your comment but did not like having a commercial business tagging on it So I removed it. Sorry. Somehow I lost my comment! Anyway, I really like both of these pieces and I still believe you find the most unique and beautiful items for your still lifes. That said, even the mundane is beautiful when you paint it! Hi harpy - i loved that on your blog by the way. I also loved seeing your dramatic sky taking shape. It's wonderful to put these two paintings together, Julie...this way we can appreciate both views...I, personally, love the fractured technique ...its so unique. I appreciate it every time you comment Hilda. thank you. I forgot to ask if Lexi liked her beautiful portrait? My next painting I sell for more than $15 I'm going to buy your Art Byte and give it a whirl. I love trying new things. Still love your Prismatic Pool. Right now I am doing a series of landscapes very loose in acrylic for the Paint New Mexico Challenge. Right after that I am going to set and try doing your fracture on some fruit still life so I can see what happens clearly for me. I am already doing the landscapes so loose that if I fracture them I think the color will turn to mud. (Very loose wet acrylic, almost watercolor) Your pots are awesome!! What a great demonstration to illustrate what can happen. And both versions are sooo lovely! thank you, dear lady! Hi Lavon, wish you would get a blog! In fracturing you cannot get mud! Honest. Thanks for the great comments and thanks for visiting. Julie, you really know how to captivate your readers. I can't wait for your post tomorrow. I haven't seen your fracturing video yet but definitely am planning on purchasing it. I did see your tools video though and want to say thank you! It was great and you're so gracious! I would love to take a workshop with any of those you mentioned above and with you. Hi Jennifer - thanks for the interest and glad you liked my tool artbyte. It is great to see what everyone is doing so if you get round to trying it please let me know. Your spring bouquet is beautiful. Very inspiring, Julie! I'm curious if you love the fracturing technique, and the results, enough to not want to go back to the more realistic painting approach. Julie, I have seen your paintings using the fracturing technique and I loved what I saw. I am so happy to be able to find you paintings to look at. I am so intrigued by this process that I just purchased the video. It's similar to using a credit card in acrylics...but I'm still wondering about the paints. Are you thinning the oil paints? I hear a swish swish in the bucket, but I don't get to see what exactly you are doing with the paint itself. It looks thinned in the beginning? is that straight thinner or do you add a bit of linseed oil? I see the full paints go on later, but wondering about the first parts of the video and what's going on with the paint itself. Thanks for your reply! Can't wait to start! My Video Demo has been Released!